It was 12:15 pm when the bomb detonated 66 years ago so they have the moment of silence at that minute. I was watching the live broadcast on Japan’s NHK channel. Shortly after the minute of silence their reporting became so asinine that I had to turn off the TV because I my lunch was starting to taste bad! Their rhetoric of trying to show how there are so many “different” opinions about nuclear power now that we have had the worst ever nuclear disaster here in Japan this year was making me sick. There is only one opinion, NO ONE WANTS BOMBS DROPPED ON THEM AND NO ONE WANTS NUCLEAR POWER STATIONS EXPLODING, ANYWHERE ANYTIME! Also they failed to mention that the uranium release from Fukushima is equal to 20, yes 20 Hiroshima bombs! Anyway I posted this video about a week ago, great info from this Kodama professor and now this guy has taken the time to translate most into English. Respect, and I am reposting here to spread the word. “We detected 5 microsieverts/hour radiation in Tokai-mura in Ibaraki Prefecture about 9AM on March 15, and notified the Ministry of Education and Science as the “Article 10 notification” [as specified in the Nuclear Disaster Countermeasures Law]. Later, the radiation exceeding 0.5 microsievert/hour was detected in Tokyo. Then on March 22 it rained in Tokyo, and with the rain came 0.2 microsievert/hour radiation, and this I believe is the reason for the elevated radiation level to this day. It was indeed in the news that 5 microsieverts/hour radiation was detected at Tokai-mura in Ibaraki Prefecture on March 15 morning, but hardly anyone, other than nuclear experts like him, connected that news with the elevated radiation level in Tokyo. The residents of Tokyo didn’t even know about it. What happened in the morning of March 15? Well, Reactor 4 at Fukushima I Nuclear Power Plant had a “big noise” which blew out the roof at 6AM, and Reactor 2 had an explosion in the Suppression Pool at 6:14AM. Or it could be from the Reactor 3 explosion in the previous day, at 11:01AM on March 14. “Why was I concerned? Because the current radiation injury prevention method is based on dealing with a small amount of radioactive materials that emit very high radiation. In this case, the total amount of radioactive materials is not much of an issue. What matters is how high the radiation is. So, instead of a small amount of highly radioactive materials in a confined area, what we have is a huge amount of radioactive materials spread wide. “When we research the radiation injury/sickness, we look at the total amount of radioactive materials. But there is no definite report from TEPCO or the Japanese government as to exactly how much radioactive materials have been released from Fukushima. “So, using our knowledge base at the Radioisotope Center, we calculated. Based on the thermal output, it is 29.6 times the amount released by the nuclear bomb dropped on Hiroshima. In uranium equivalent, it is 20 Hiroshima bombs. “When a vast amount of radioactive materials is released, they are in particles. Dispersion of particles is non-linear, and it’s one of the most difficult calculations in the fluid dynamics. The nuclear fuel is like sands buried in synthetic resin, but once the fuel melts down, a large amount of super-fine particles is released. “We at the Radioisotope Center have been helping Minami Soma City in the decontamination effort. We’ve done seven decontaminations so far. When we went to Minami Soma for the first time, there was only one geiger counter. On March 19 when the Ministry of Agriculture, Forestry and Fisheries supposedly issued the notice [on the cattle feed], food, water, and gasoline were about to be depleted in the city. The mayor of Minami Soma made a plea for help on the Internet, which was widely viewed. “In that kind of situation, no one would look at a piece of paper from the Ministry, no one would know. Farmers didn’t know that rice hay was in danger. Still, they bought the feed from abroad, paying hundreds of thousands of yen, and started to feed the cows with the same groundwater that they drank. “So, what should we do now? We have to guarantee that the thorough radiation measurement is done in the contaminated area. As I said before, there was only one geiger counter in Minami Soma City when we went there in May. In fact, there were 20 personal survey meters provided by the US military. But no one at the city’s Board of Education could understand the English manual until we went there and told them how to use them. That’s how it is there. “As to the food inspection, there are more advanced survey meters than germanium counters, such as semiconductor detectors. Why doesn’t the Japanese government spend money in supporting [the development of these advanced detectors?]? Part 2 of Professor Tatsuhiko Kodama’s testimony on July 27 to the Committee on Welfare and Labor in Japan’s Lower House in the Diet. Professor Kodama is the head of the Radioisotope Center at the University of Tokyo. I have been in charge of antibody drugs at the Cabinet Office since Mr. Obuchi was the prime minister [1998-]. We put radioisotopes to antibody drugs to treat cancer. In other words, my job is to inject radioisotopes into human bodies, so my utmost concern is the internal radiation exposure and that is what I have been studying intensely. The biggest problem of internal radiation is cancer. How does cancer happen? Because radiation cuts DNA strands. As you know, DNA is in a double helix. When it is in a double helix it is extremely stable. However, when a cell divides, the double helix becomes single strands, doubles and becomes 4 strands. This stage is the most vulnerable. Therefore, the fetuses and small children, with cells that rapidly divide, are most susceptible to radiation danger. Even for adults, there are cells that rapidly divide such as hair, blood cells and intestinal epitheria, and they can be damaged by radiation. Let me give you an example of what we know about internal radiation. Alpha radiation is most famous. I was startled when I learned of a professor at Tokyo University who said it was safe to drink plutonium. Alpha radiation is the most dangerous radiation. It causes thorotrast liver damage, as we, liver specialists, know very well. Internal radiation is referred to as such-and-such millisieverts, but it is utterly meaningless. Iodine-131 goes to thyroid gland, and thorotrast goes to liver, and cesium goes to urothelium and urinary bladder. Whole body scan is utterly meaningless unless you look at these parts in the body where radiation accumulates. Thorotrast was a contrast medium used in Germany since 1890. It was used in Japan since 1930, but it was found that 25 to 30% of people developed liver cancer 20 to 30 years later. Why does it take so long before cancer develops? Thorotrast is an alpha-radiation nuclide. Alpha radiation injures nearby cells, and the DNA that is harmed most is P53. We now know, thanks to genome science, the entire sequence of human DNA. However, there are 3 million locations on the DNA that are different from person to person. So today, it doesn’t make sense at all to proceed as if all humans are the same. The basic principle should be the “personal life medicine” when we look at internal radiation – which DNA is damaged, and what kind of change is taking place. In case of thorotrast, it is proven that P53 is damaged in the first stage, and it takes 20 to 30 years for the 2nd, 3rd mutations to occur, causing liver cancer and leukemia. About iodine-131. As you know, iodine accumulates in thyroid gland, and that is most noticeable during the formative phase of thyroid gland, i.e. in small children. However, when the first researcher in Ukraine was saying in 1991 “There are an increasing number of thyroid cancer”, researchers in Japan and the US were publishing articles in Nature magazine saying “There is no causal relationship between the radiation and thyroid cancer.” Why did they say that? Because there was no data prior to 1986, there was no statistical significance. The statistical significance was finally noted 20 years later. Why? Because the peak that started in 1986 disappeared. So even without the data prior to 1986, the occurrence of thyroid cancer and radiation exposure from Chernobyl had the causal relationship. Epidemiological proof is very difficult. It is impossible to prove until all the cases are done. Therefore, from the viewpoint of “protecting our children” a completely different approach is required. Dr. Shoji Fukushima from a national institution called Japan Bioassay Research Center, which researches health effects of chemical compounds, has been studying diseases involving urinary tract since the Chernobyl accident. Dr. Fukushima and doctors in Ukraine studied parts of bladders removed during more than 500 cases of prostatic hypertrophy surgery. They found out that in the highly contaminated area where 6Bq/liter was detected in urine, there was a high frequency of mutation of p53 though 6Bq may sound minuscule. They also noticed many cases of proliferative precancerous conditions, which we assume was due to the activation of p38 MAP kinase and the signal called “NF-kappa B,” leading inevitably to proliferative cystitis, with carcinoma in situ occurring with considerable frequency. Knowing this, I was astounded to hear the report that 2 to 13Bq/liter [of radioactive cesium] was detected from the breast milk of seven mothers in Fukushima. Professor Kodama is saying that by the time we have proof that there is a causal relationship between internal radiation exposure (however small) and cancer, it may be too late. Thorotrast is a suspension containing the radioactive particles of thorium dioxide. Testimony by Professor Tatsuhiko Kodama of Tokyo University continues. He goes back to Minami Soma City where his Radioisotope Center has been helping to decontaminate. We at the Radioisotope Center of Tokyo University have been helping to decontaminate Minami-Soma City, sending about 4 people at a time and doing decontamination work for the length of 700km per week. Again, what’s happening to Minami-Soma clearly shows that 20 or 30 kilometer radius [from the nuke plant] doesn’t make any sense at all. You have to measure in more detail like measuring each nursery school. Right now, from the 20 to 30 kilometer radius area, 1,700 school children are put on the buses to go to school. Actually in Minami-Soma, the center of the city is located near the ocean, and 70% of the schools have relatively low level of radiation. Yet, children are forced to get on the school buses to go all the way to schools near Iitate-mura [where radiation is higher], spending 1 million yen everyday for the busing. I strongly demand that this situation be terminated as soon as possible. What’s most problematic is the government’s policy that they will compensate the residents for the moving cost only if their areas are designated as official evacuation zones. In a recent committee held at the House of Councilors [Upper House], President Shimizu of TEPCO and Mr. Kaieda, Minister of Economy, Trade and Industry answered that way. I ask you to separate the two immediately – compensation criteria issue and children’s safety issue. I strongly ask you to do whatever you can to protect the children. Another thing is, what I strongly feel when I’m doing the decontamination work in Fukushima is that emergency decontamination and permanent decontamination should be dealt with separately. We’ve been doing a lot of emergency decontamination work. For example, if you look at this diagram, you will notice that the bottom of this slide is where small children put their hands on. Every time the rain streams down the slide, more radioactive materials accumulate. There can be a difference in radiation level between the right side and the left side. If such difference occurs and if the average radiation of the slide is 1 microsievert, then one side can measure as high as 10 microsieverts. We should do more emergency decontamination work in such places. The ground right under the roof gutter is also where children frequently put their hands on. If you use high pressure washer you can reduce the radiation level from 2 microsieverts to 0.5 microsievert. However, it is extremely difficult to lower the level to less than 0.5microsievert, because everything is contaminated. Buildings, trees, whole areas. You can lower radiation dose of one place, but very difficult to do that for the whole area. Then, how much will it cost when you seriously do the decontamination work? In case of “Itai-Itai Disease” caused by cadmium poisoning, to decontaminate half of cadmium-contaminated area of roughly 3,000 hectare, the government has spent 800 billion yen so far. How much money will be needed if we have to decontaminate the area 1,000 times as big? So, I’d like to make four urgent requests. First, I request that the Japanese government, as a national policy, innovate the way to measure radiation of food, soil, and water, through using the Japan’s state-of-the-art technology such as semiconductor imaging detectors. This is absolutely within Japan’s current technological capability. Second, I request that the government enact a new law as soon as possible in order to reduce children’s radiation exposure. Right now, what I’m doing is all illegal. The current “Radiation Damage Prevention Law” specifies the amount of radiation and the types of radionuclides that each institution can handle. Now Tokyo University is mobilizing its workforce in its twenty-seven Radioisotope Centers to help decontaminate Minami-Soma City, but many of the centers don’t have a permission to handle cesium. It’s illegal to transport it by cars. However, we cannot leave highly radioactive materials to mothers and teachers there, so we put them all in drums and bring them back to Tokyo. To receive them is illegal. Everything is illegal. The Diet is to blame for leaving such situations as they are. There are many institutions in Japan, such as Radioisotope Centers at national universities, which have germanium detectors and other state-of-the-art detectors. But how can we, as the nation, protect our children if these institutions’ hands are tied? This is the result of the gross negligence by the Diet. construction companies such as Takenaka Corporation. Please mobilize their power to create a decontamination research center in Fukushima as soon as possible. We don’t have the luxury to spare a single second considering the financial condition of the Japanese government. We must figure out how we really do the decontamination work. What on earth is the Diet doing, when 70,000 people are forced out of their homes and wandering? 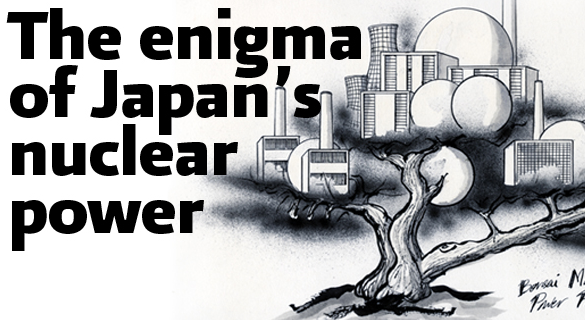 Great interview with Greenpeace concerning the continuing disaster in Fukushima. This guy knows his stuff and talks it straight. This is not the only report that has said it, but it is becoming rather apparent that Japan is handling this disaster far worse that Russia did back in 1986 with Chernobyl. Kind of hard to believe but looks to be true. This is well worth watching.